Michael O'Leary, the boss of Ryanair, is spending half a million euro on promoting a "Yes" vote for the Lisbon Treaty in the Republic of Ireland. O'Leary says that "Ireland’s future success depends on being at the heart of Europe and our membership of the euro" but doesn't explain why voting no to the EU not-a-constitution means Ireland can't be at the heart of Europe if it wants to be or why it can't remain in the euro. He goes on to say that if the Irish vote "No" to Lisbon, "the Irish economy would be run by our incompetent politicians, our inept Civil Service and the greedy public sector trade union bosses who, through social partnership, have in recent years destroyed Ireland’s competitiveness, created an epidemic of useless quangos and feathered the nests of the public sector at the expense of ordinary consumers in Ireland" but doesn't explain how the EU's economic mismanagement and narrow vested interests (the EU hasn't signed its own accounts off because of fraud for 13 years) will be an improvement over how the Irish can run their own country or how the EU not-a-constitution will cut the number of useless quangos that are only in existence because of the EU, not in spite of it. He says that Ryanair will be spending €300,000 on "deeply discounted seats" to emphasise the EU's policy on low cost seats but doesn't explain how the EU can have a commitment to low cost air travel whilst imposing most of the taxes and levies that are lumped on top of the cost of a plane ticket. It seems that only in the European Union, Ireland and Zimbabwe you are forced to vote twice, the vote should be respected. It is the only democratic thing to do. I am fundamentally anti the mismanagement and corruption in Brussels. I hate the bureaucracy. O'Leary is a fraud and a hypocrite. His public - and expensive, for the shareholders of Ryanair - support for the EU not-a-constitution is nothing to do with what is right for Ireland or for the Irish people, it is all about what is good for his business. 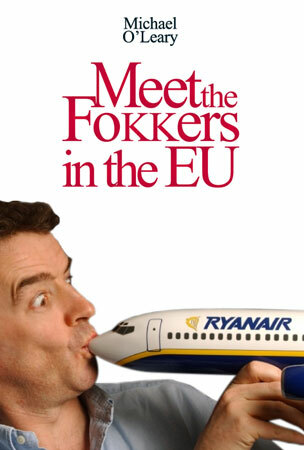 EU enlargement means a bigger European market for Ryanair. Increasing the number of member states in the Shengen area (which the Irish government may join if the EU not-a-constitution gets through) means less money for Ryanair to spend on passport control. And I'd put money on O'Leary being offered all sorts of "incentives" (what most of us would call "bribes") for Ryanair - cheaper departure taxes, lucrative routes, tax breaks - in return for supporting the EU not-a-constitution. Below is a quote from MOL about UKIP being economic illiterate and the source. Some time ago Declan Ganley questioned the commitment to free trade from UKIP in a Sunday Independant article with which Mr. Worstall promptly set the record straight in the next edition's letters. We all know MOL can be a bit cavalier in his remarks but really this is a disgrace. I hope you set MOL right on this too for all our sakes.